Brazil and Atlético Mineiro forward Ronaldinho will no longer amuse his fans with his trademark smile after undergoing surgery to have his teeth straightened and realigned. 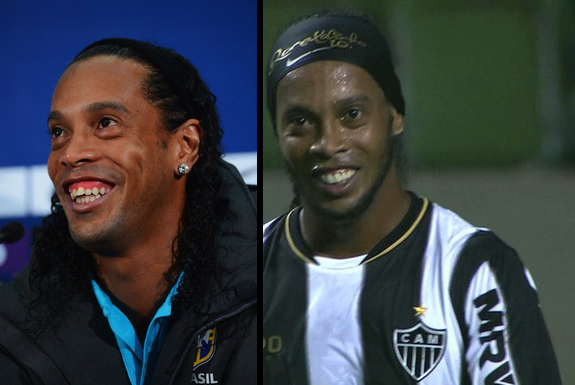 Ronaldinho's infectious smile has always been one of his many endearing traits, but it's also been the subject of many hurtful jokes over the years. From cartoon characters to advertisements, each depiction of Ronaldinho seemed to focus on the physical trait, to the extent that even his own comic book emphasises his teeth. However, no matter what was said or how he was depicted, it never seemed to bother the two-time FIFA World Player of the Year. And yet at the age of 33, he somewhat surprisingly decided to undergo cosmetic surgery to fix his teeth and gums. According to Brazilian newspaper O Globo, Ronaldinho underwent the procedure in the southeastern Brazilian city of Belo Horizonte on Tuesday. Apart from realigning his teeth, the operation involved the insertion of porcelain veneers and gum reduction surgery. "It is part of his normal (dental) treatment and won't affect him at all," Roberto Assis, who is Ronaldinho's agent and also his brother, told the newspaper. His first match with the new smile was against Bahia in the Campeonato Brasileiro on Wednesday.